My hometown bowling alley had Space Invaders in an upright cabinet, thus they became the beneficiary of many of my quarters. Every time I went there, I marveled that people really do bowl - astonishing. I just went for the crappy nacho platters and Space Invaders. For me bowling alleys were all about arcade games and whatever food was served. 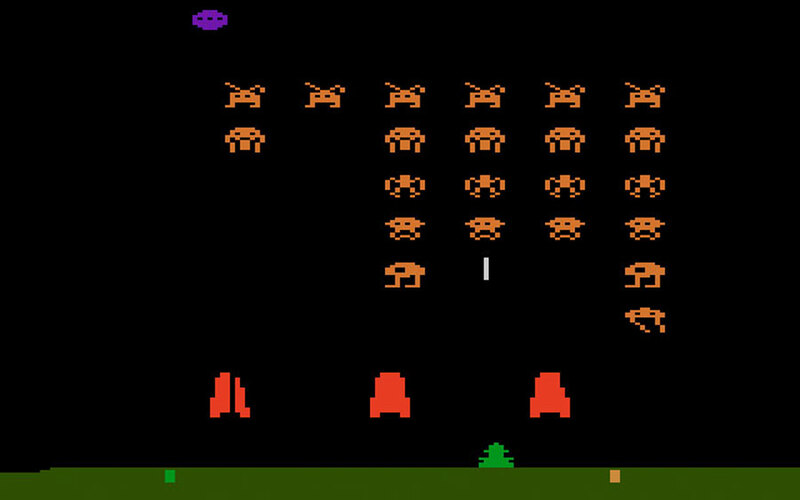 Space Invaders was the first 2600 game I purchased! The manic sound of descending invaders caused me immense stress as the tempo increased and each wave appeared closer to my cannon. I found this equally true when playing in my living room. The 6 x 6 grid of 36 invaders kept my pulse racing - the excessive caffeinated beverages may have contributed. Either way, Space Invaders was one of the arcade-conversions that (for me) was equally as fun as the arcade version in the bowling alley. 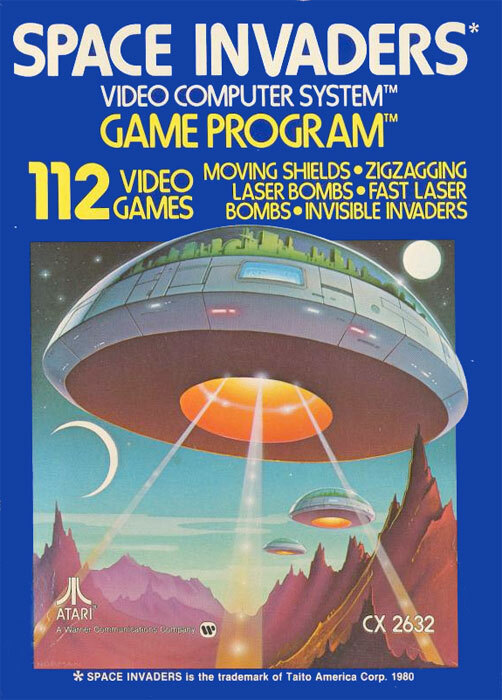 Color graphics on the 2600 were a plus as were the many options from zigging bombs to invisible invaders and controlling the width of your laser cannon. Part of the tension arises from the single shot capability of the cannon. You can't fire again until you hit an invader or your laser beam goes off the top of the screen. More tension comes from the knowledge that you will never win! Wait... what? Yep, the game is infinite and will keep going until your demise. However, your dreams of epic high scores are cut short to the four displayable digits atop the screen. You will max out at 9,999. The arcade cotrols were inline with the simplicity of the 2600 joystick's configuration. Shooting an invader garners points (between 5 and 30) depending on their initial screen position. You can also fire away at the periodic Command Alien Ship (200 points) that appears at the top of the screen. He can't fire at you, but he's a great distraction when you're under fire and imminent death. And don't forget you can't travel the full screen width - pillars on the right and left define the end-points of your laser cannon's movement. It may look like more on-screen, but you can easily get cornered by enemy fire. were not powerful enough to perform the complex tasks involved in designing and programming Space Invaders, Nishikado had to design his own custom hardware and development tools for the game. 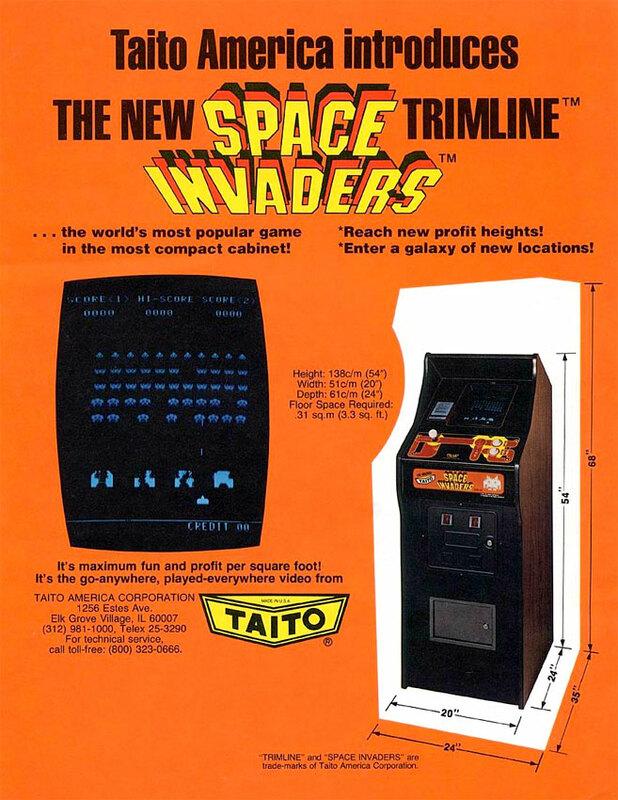 After it's release in arcades, Space Invaders caused a temporary shortage of 100-yen coins in Japan, grossed $2 billion in quarters by 1982, and by 2007 had earned Taito over $500 million in profits. Guinness World Records ranks it the top arcade game. The Difficulty Switches add a nice touch that is combined, but not duplicated, with the 112 game variations. The "B" setting makes your cannon wider and more susceptible to enemy laser bombs. If you're wondering how hard it is to navigate 112 game options with a single Game Select switch, fear not - hodingholding down both the Select and Reset switches increases the rotating game numbers more rapidly. Clever! Your many options apart from 1 or 2-player modes include moving shields, zigzagging bombs, fast bombs and invisible invaders. Yeah, invisible - try getting that last one in time! Where this home release for the Atari 2600 really shines is the cooperative partnership variations. For example one player can move the ship to the right and the other player can only move it to the left. Teamwork, Baby! There is also alternate firing as well as sparating the duties of moving and firing. These options make 2-player variations more fun than most multi-player games. ...Of course the king is 4-player Warlords with beer. is a classic shooter that brought vitality to many dank bowling alleys. 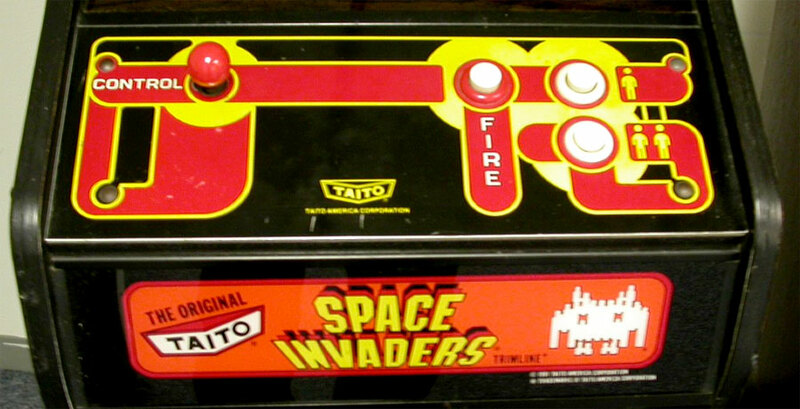 For the 2600 Space Invaders offers a lot of varied game play and fun for one or two players.